Those words were written by our founder, Jamie Tworkowski, on the final night of National Suicide Prevention Week. When our team got together to start dreaming up something new, we kept coming back to “We’ll See You Tomorrow.” Hope always involves tomorrow. It’s choosing to believe that things can change, that tomorrow can look different than today. “We’ll See You Tomorrow” will run from now until September 13. Over the course of the month leading up to World Suicide Prevention Day, we’re partnering with other organizations and with people everywhere to challenge the stigma surrounding suicide. Our goal is to raise $75,000 via Classy, all of which will go to treatment and recovery. Buy the World Suicide Prevention Day pack. Each pack includes a shirt, a bracelet, 3 poster prints, a response card, and 15 info cards. 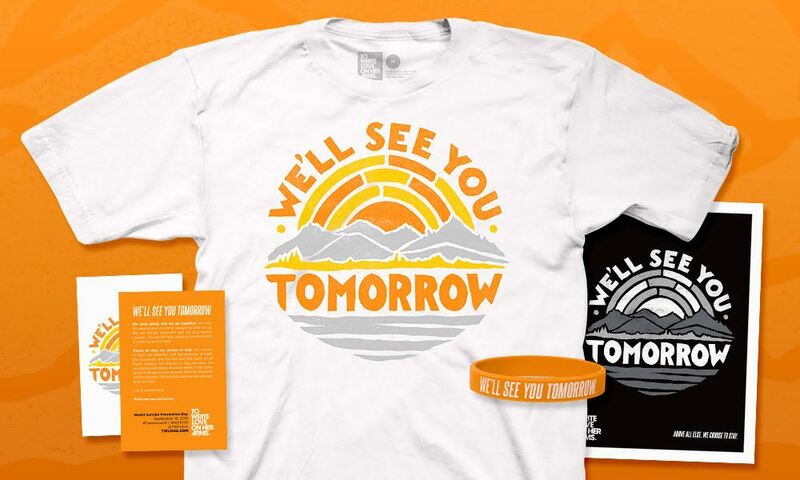 These materials feature our “We’ll See You Tomorrow” design printed in orange, which is often associated with suicide prevention. All of these items are meant to equip you to talk about suicide prevention in your community. Use them as conversation starters, encouraging reminders, and informative tools to share with others. Finally, be sure to wear your shirt and bracelet on World Suicide Prevention Day (September 10)! Join the conversation and post photos using #Tomorrow15 & #WSPD15. Be sure to tag @TWLOHA on Twitter & Instagram. You can also download our social media assets to change your profile picture, Facebook cover image, and Twitter header image. There will also be specific ways to participate during National Suicide Prevention Week (#NSPW15), and we will share those with you as it gets closer. 2 VIP tickets for you and a friend to Vans Warped Tour in the city closest to you. We’ll cover your travel expenses and give you $200 worth of TWLOHA merch. 2 VIP tickets for you and a friend to HEAVY AND LIGHT in Orlando, FL, complete with round-trip airfare and hotel stay. Thank you for supporting TWLOHA. Thank you for caring about people. May we continue to fight for the stories around us. It’s weird. I’ve been struggling with depression etc all my life and for the last two years I’ve been on sick leave because of clinical depression and suicidal behaviour. Still am at a bad place. The reason for my complete breakdown was that I lost my reason for living, the most important being in my live died. It happened September 10th. And I just learned that that’s the World Suicide Prevention Day. Kind of scary. We’re sorry to hear that you’re struggling with depression and suicidal thoughts right now. We’d love to send you some encouragement. Would you mind emailing info@twloha.com? As a random human being I wouldn’t mind being an ear for you to vent or for anyone to vent. Everyone needs someone! I just lost my cousin yesterday to mental disorder I know what it’s like and what it can do. How I was I could see you tomorrow. How could I joined the WORLD SUICIDE PREVENTION DAY? Can we use the logo and make button pins out of it? You’re smile and personality is gonna brighten someone’s day tomorrow think of how amazing that is! I was once at deaths door by my own hands. Saved by someone who heard a deadness in my last words spoken to them. We’ll see you tomorrow will save lives that need to finish their story. Thank You. I am glad you were saved from deaths doors the world is a better place with you here. It’s an amazing place with everyone here reading these words. It’s our world our life live it love it !! Incredible work you are doing for those in need. Thank you. It’s said over and over there is someone to talk to and it’s true but you have to take the option of talking. My cousin lost his battle with mental disorder yesterday and I can’t help feeling we should have done more. This needs to be cured!!! Pingback: Recovery. | Alyssa T.
This is a subject that I’m very passionate about and I’m planning to get together with a few friends downtown to pass out info cards and spark conversation. I’ve already purchased the level 2 pack, but I was wondering if it is possible for you to make info cards available for bulk purchase. Everyone says “go big or go home” and I’m praying for big. I want to get cards to as many people as possible and equip my friends to do the same. Alternatively, a template so that we could print off info cards on our own would be great. We’re so happy to hear that you’ve bought our level 2 pack and want to do as much as you can to spark conversation. Will you email our team at merch@twloha.com about your info card request? How can I fill out one of those “This is why you’ll see me tomorrow…” cards? Are those included in the promotion pack? I am a mother of 3 and a wife and a daughter to an awesome mom. I have suffered anxiety and depression for many years. I have gone through so much in my life. It hurts me to know my oldest daughter is battling the same things I do. I tell myself I need to be strong and be here for my girls and my family. I tell my girls every day that I love them and I Will See Them Tomorrow. Your website really tells a story. I have been cutting for 5 years now (Since I was 11) and your website has inspired me to stop. Thank you so much for your kind comment. We’re sorry to hear that you’ve struggled with self-injury for a while. If you need them, we list resources here: https://twloha.com/find-help/help-by-topic/self-injury/. Is there anyone in your life (a friend, parent, etc.) that you can talk to about your self-injury, Shelbie? We encourage you to tell someone you trust how you’re feeling. If you need some encouragement, we’d love to hear from you. You can reach us by emailing info@twloha.com. You know, some depressed people (and ______) use food for comfort and because they do they don’t fit in the usual XS to 3x range. I wish TWLOHA would understand that and start carrying at least a few of their shirts in larger, meaning 4x-5x sizes. I didn’t even know you existed until I saw it on my facebook. It’s really cool that your here. What can I do to help? I also didn’t know there was World Suicide Prevention day or week. People need that. Please tell me what I can do to help. Thank you so much for your kind comment! One of the easiest ways to participate is by ordering our World Suicide Prevention Day packs here: http://store.twloha.com. If you have any questions in the future, you can reach our team at info@twloha.com. Hi! I would love to write a story for suicide prevention week but, I am not able to pruchase the prevention pack. Is there a way you can send/email me the form that says: ”you’ll see me tomorrow because”? Hope to hear something back. We’re hoping to make a downloadable PDF of the form available early next week. Stay tuned for our blog to see that! Hello! I would like to use your “You’ll see me tomorrow because..” template to start conversations on the campus I work at. Could you please send me a pdf copy? Thank you! Check back on our blog on Monday! We’ll include a link to the PDF download that day. Sou brasileira, assisti o filme hj pela primeira vez, me indentifiquei muito pq sou bipolar. Tentei suicidio várias vezes, fui internada por várias vezes, me auto mutilo, corto meus braços e minhas pernas. Estou sozinha, ninguem entende o que eu sinto o porque hajo de forma diferente, as pessoas simplesmente me julgam sem ao menos tentar entender. Não sou feliz, e não queria estar aqui mas pelos meus filhos tento acordar e dormir todos os dias. É bom saber que não sou a única, mas ao mesmo tempo e triste saber que existe outros pessoas tao sozinhas e confusas como eu, tentando achar seu lugar no mundo e vivendo um dia de cada vez, sem ter a certeza se tera o amanhã. I am currently writing a one act play for my students that deals with suicide, and most importantly, suicide prevention. We have lost several young people in our student body over the course of a few short years, and it is time to take action. I want to know two things – may I quote you in a projection slide, using ” we’ll see you tomorrow?” and secondly, how much to buy about 30 suicide prevention packs? Thanks in advance! Would you mind emailing merch@twloha.com about the packs? As for the slide, you may absolutely quote “We’ll See You Tomorrow” as long as you give credit to the poets (Sierra DeMulder and Tonya Ingram). Pingback: See You Tomorrow | Can I Vent Real Quick? I would like some more info WSPD in 2016 please. does anyone have information for this year’s event yet? Will there be merchandise available for the 2016 Suicide Prevention Day? Yes! Each year we host our own World Suicide Prevention Day campaign. We will announce our campaign slogan and release our design in August. I am 26 years old, and I have been _____ for 17 years. 2 years ago, I opened up, shared my story to give hope to others. I want to spread more awareness about mental self and self harm. Thanks for your comment! Will you please email info@twloha.com? We’ll send you more information about how you can get involved. 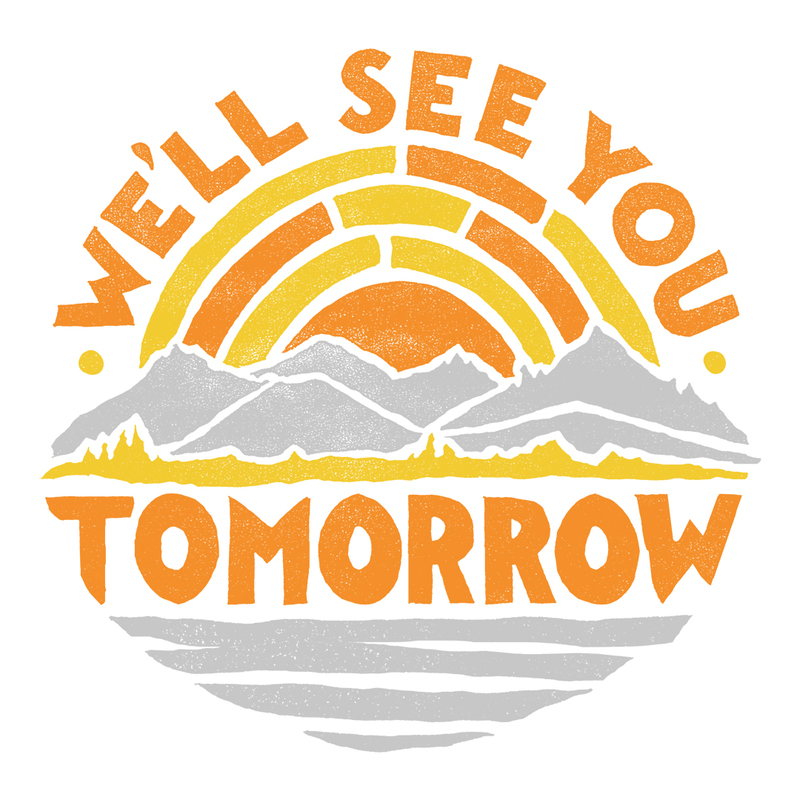 My daughter would like the 2015 World Suicide Prevention t-shirt…We’ll See You Tomorrow. Are those shirts still available to purchase? Unfortunately those shirts are no longer available! Thanks for reaching out. It just means that each day WILL NOT be like the last. Stay strong.